Seniors aren't receiving enough support from the government and their offspring due to other personal obligations, making it difficult for all parties to lead a happier life. Government programs that offer personal support workers (PSWs) take too long to onboard clients or don’t provide enough time to be effective (this hurts both clients and workers). On top of that, loneliness seniors face a bigger problem than just an emotional experience. Research shows that loneliness and social isolation can be harmful to our health. Seniors are not the primary decision makers. Their children are. This rapidly growing demographic is estimated to double in the next decade, affecting a significant number of baby boomers. In order to help the elderly, we must first aid the care seeker. Help care seekers overcome the difficulties in finding more compatible support. 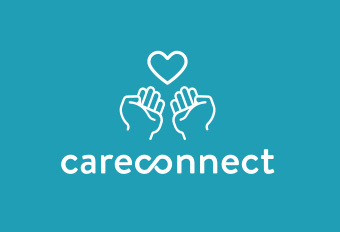 CareConnect will facilitate the connection between care seekers and caregivers. People can find each other based on language preferences, care types, and availability. Elderly needs vary, so this platform will give them more control over finding the right fit, whether it's compatibility or scheduling, resulting in a happier, long-term relationship. The 6 week sprint plan involved a number of steps to ensure users will enjoy using this product. 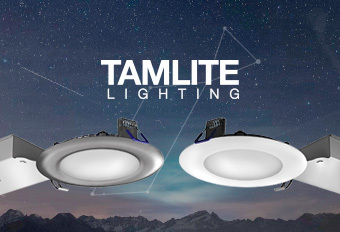 During the ideation stage, my concept was to create a hub that connects several non-invasive devices such as motion sensors, or smartwatches to passively monitor their loved ones. 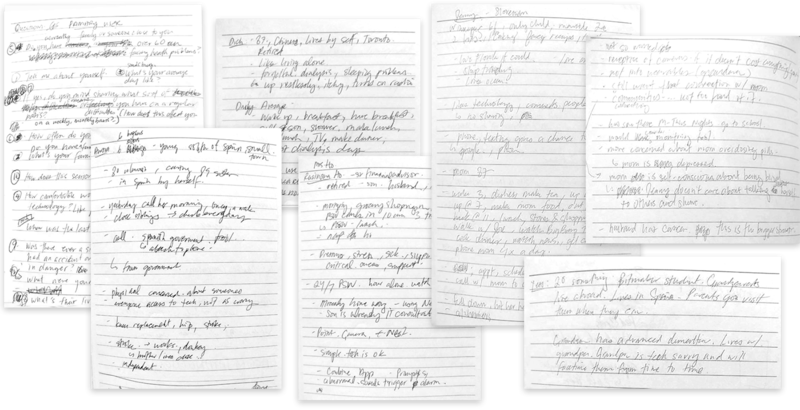 After listening to each interviewee's story, it was clear that my original concept addresses a small portion of user needs and wouldn't be viable as a business. Each interviewee presented a different concern. Some required daily needs such as making sure the person needing care is eating or bathing, while others were more concerned about their mental well-being. One commonality is the need for someone to be physically there to assist day-to-day needs or provide companionship elders have lost over the years. 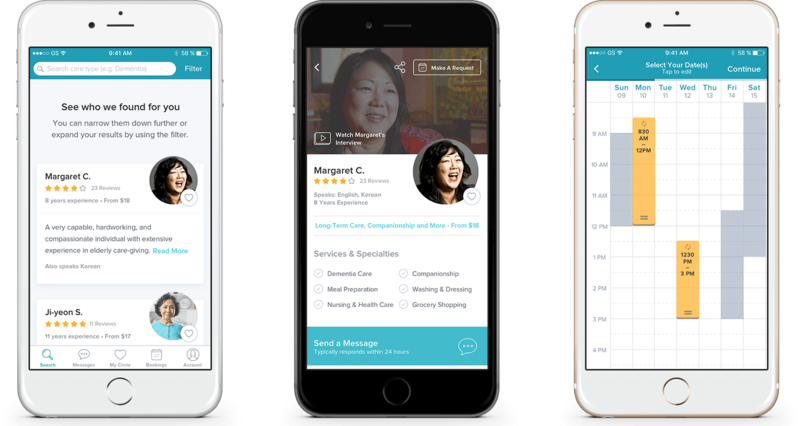 The main application focuses on the care seeker, Candy, who is the primary decision-maker for her 89-year-old mother. Candy is juggling several obligations at this stage of her life—career, sick husband, and a mother who suffers from dementia. She isn't the most tech-savvy user, however, she'll pick things up fairly quickly once she gets the hang of it. She currently receives 2 hours a visit from a PSW provided by the government however that isn't enough. Because the application's success relies on an interdependent ecosystem, I had to be mindful of the caregiver's persona as well. 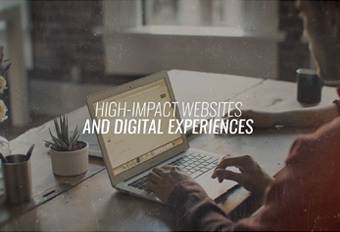 Complete user personas and job stories are available here. 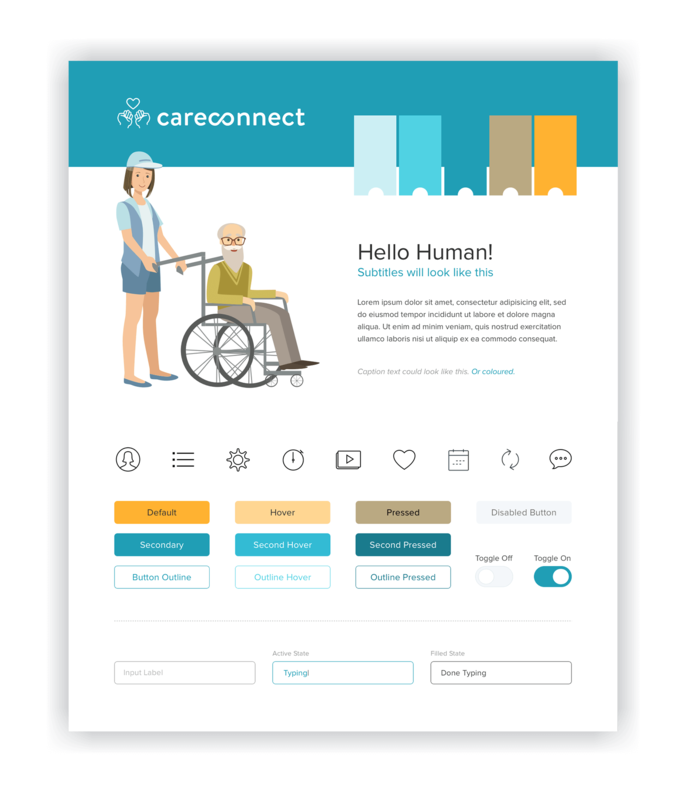 Establishing the user's core journey: Booking a caregiver. 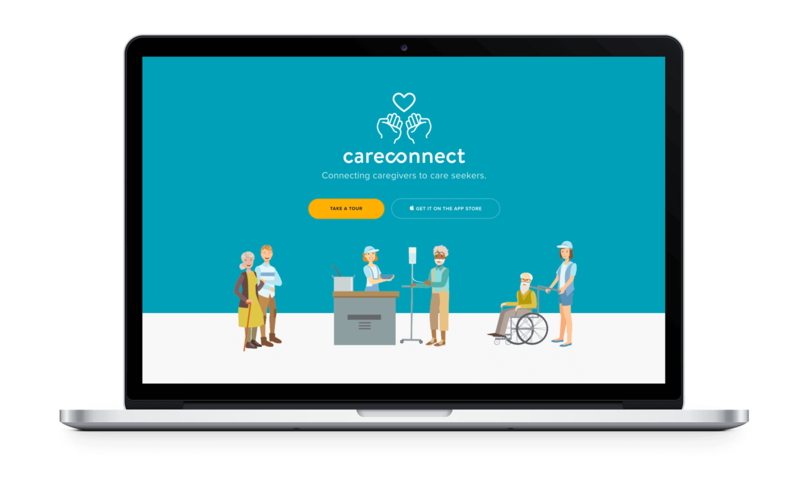 With a robust application such as CareConnect, I focused on the areas that a care seeker would need to access in order to successfully book a caregiver. In the information architecture, I broke down what were pieces of information would be needed to create each section, and what data should be collected during onboarding to help make the booking process more seamless for the user. 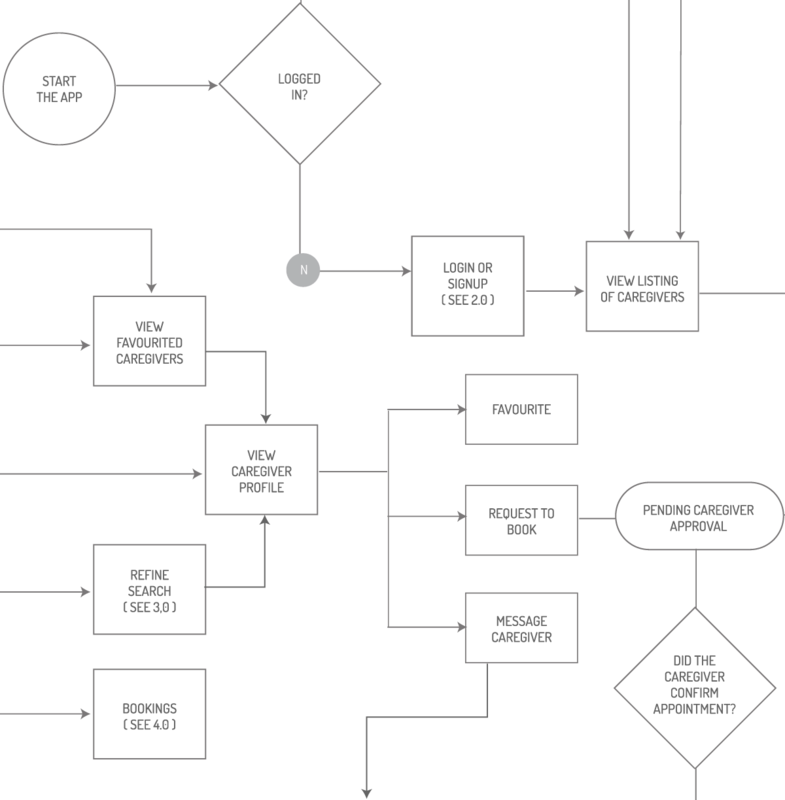 Despite having all these key elements, several iterations of the user flow were explored. When I took the caregiver's journey into consideration and what care seekers needed to narrow their search, minute details had to be reshuffled to create a harmonious flow. Navigating through the app's informational areas was pretty straightforward, however, most users struggled to complete the booking process. After completing the first round of the application's main features, a usability test was conducted consisting of 5 task actions phrased in an effective fashion, without leading comments. Structure varied from question to question to provide a more natural interaction. 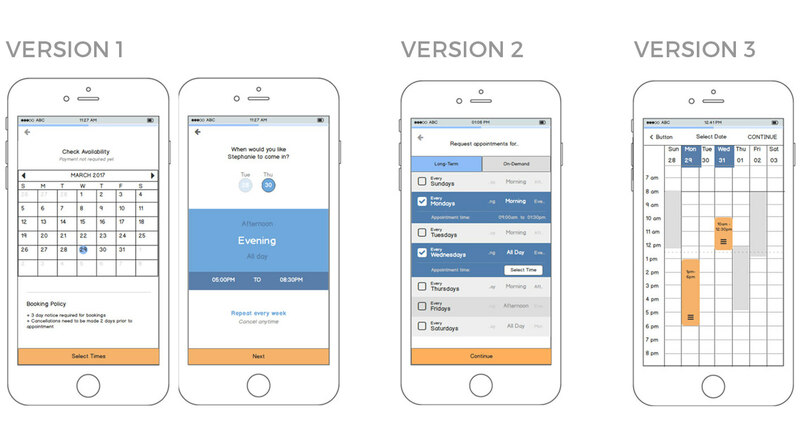 My initial idea was to group options by time of day so there are less granular details to worry about for both caregivers and their clients. Unfortunately, my initial booking interface was too different from a typical event booking, making it confusing for the older demographic. Plus they wanted flexible times. 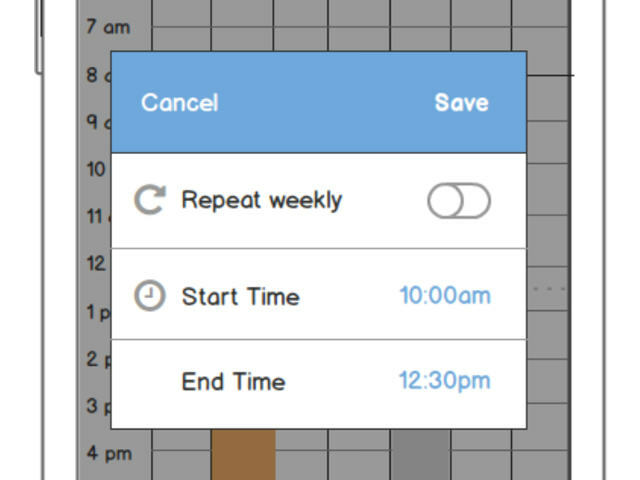 Separating the day and time selector into two different pages did not allow for the user to know they can repeat schedules. Most of the testers wanted long-term care options so they tended to select all the Tuesdays on the first page. This iteration puts long-term care first, showing the user the ability to select repeat schedules. I still kept the time of day selection, but after testing, everyone wanted the ability to make hourly adjustments immediately. Using the standard calendar UI allowed for a more intuitive experience. This method has a smaller curve and requires fewer taps to book. Minimum appointment hours are automatically populated when the user selects a day. 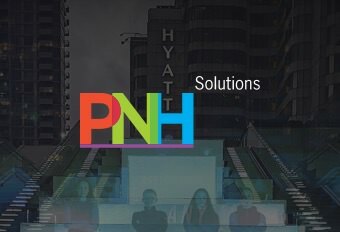 By using a standard calendar system and presenting key variables (start + end time, repeat weekly), the booking process was more understandable. This also reduced the number of actions needed to complete the task. When a user taps on the calendar to create an appointment, the minimum schedule requirements will automatically populate. Taking visuals that are generally associated with an outdated healthcare system and giving it a youthful update—vibrant colours, diverse illustrative characters, and selecting Proxima Nova, a font people can easily connect with. Users were asked to go through the entire process—from onboarding to booking an appointment—in person. I observed their reactions and asked for feedback. Because the main functionality was sorted out during the wireframe stages, I was able to avoid time-consuming revisions while I was revising my hi-fidelity designs. Most changes consisted of colour and language tweaks to better suit my demographic's needs. Users want to know why they need CareConnect before downloading it. 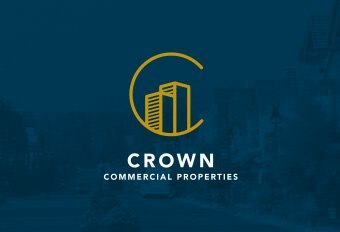 This responsive marketing site will introduce the application's selling points and the booking process details, such as a secure payment structure. 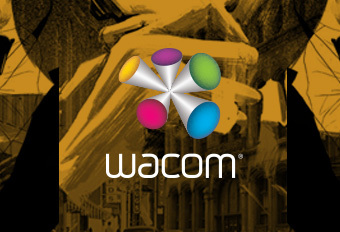 There will also be a marketing video to further engage visitors.